Headed toward the south cut. Can you see JR's house? Salt Pond, Long Island: The mainsail and anchor are up by 6:45 am with rain showers behind us to the west. We wave to Puffin and Encore as we motor down the harbor in calm winds (JR's house on Man of War Cay clearly silhouetted in the sunrise; Thornless). We pass through some new channel markers that denote a break in the reef. They were destroyed by Joaquin and just replaced by our fellow cruisers. Thanks guys! (We skipped reanchoring closer to the south cut because of gusty winds the day before, but it's flat calm as we head toward the south cut.). The genoa is unfurled and we see two masts ahead of us exiting the south cut. I attempt to hand the helm over to The Captain. I figure I'm way ahead on the "cut" count, but he says "you always do morning shift" and disappears down below to make his breakfast. It's a relatively "long" but wide cut, with coral heads in a long zig zag. It has a minor swell this morning. 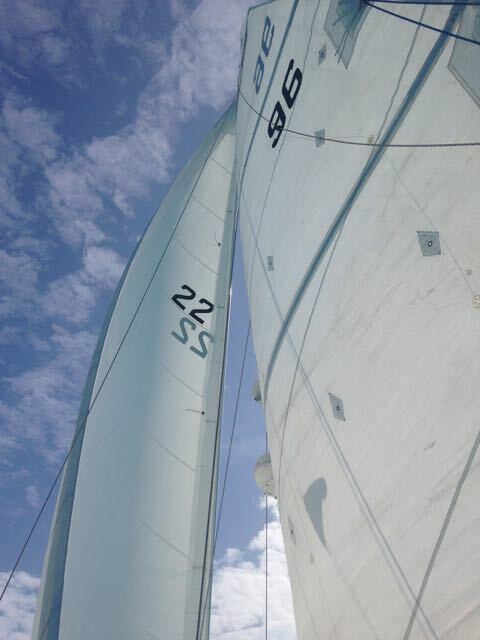 We round the corner southbound with minimal sail trim required and enter the Exumas Sound/Atlantic. The water depth is quickly 65 ft of calm water and the fishing line is deployed. Thornless says it is a 120 heading down Great Exuma to White Cay. Our chartplotter has us on a 128 course-over-ground with an island clearly in sight for visual pilotage (it turns out to be Hog Cay instead of White which is very low lying). Both engines are off and we are doing 7 kts on a close/beam reach with 12-14 kts of wind. We cross the Tropic of Cancer (N 23.26.14)! The area bounded by the Tropic of Cancer on the north and Tropic of Capricorn on the south is known as the "tropics." (This area doesn't experience seasons because the sun is always high in the sky. The solar panels are doing the happy dance). The water gradually changes from the dark purple of 65 ft to dark blue at 45 ft, turquoise as we cross over 45 ft and at 20 ft, The Captain can see the bottom through the light turquoise Bahama waters. We are VPR (visual piloting rules) as we reenter the 11 ft "banks" and the wind drops to 10 kts on a close reach sailing at 5.5 kts. The high tide has "followed us" (high tide in Georgetown is (Nassau + 20 and Salt Pond is Nassau + 2:30) and we don't see any coral heads that require deviating. We make the turn for the 18 nm from Great Exuma to Long Island. Instead of making the turn down to Salt, we maintain our heading east and continue across to Long, gradually working our way south down the coast as the wind clocks south. We round the point with the sails still up (Yep, Agape spotted us entering the harbor from town). As we select our spot at the end of the line and drop anchor, we receive a text with directions to the dinghy dock and nearest pub. The perfect end to the perfect day! Stats: Total time 6:59, avg speed 5.4 kts, total mileage 37.9. Sailed main & full genoa for 1/2. Motor-sailed one-engine for half. After a quick catch up with Kelly Nicole, the conversation turns to routing. A small percentage of cruisers make the crossing from Georgetown to Long Island. For us, it's the start of repositioning for the trip farther south down the Caribbean chain. The long term goal is to be in Trinidad by July 15th (insurance company's hurricane deadline). The midterm goal is the Virgin Islands. The short term goal is Dominican Republic. Again, we're told the weather has been "weird" this year--everything from mild trade winds, choppy on the banks and fronts making it farther south and more often than normal (a local in Black Point described it as a summer weather pattern). This makes you want to throw the guidebooks overboard! So we spend hours studying forecasts and possible reroutes gleaned from drunk cruisers at the bar. The end result will probably be passing up some cool places like Conception & Samana, but we can't risk getting caught in these unprotected anchorages by the short weather windows. Long Island has more settlements than any of the Bahamian islands. It also has a distinct foreign influence, apparent by the multitude of accents at the bar and wide selection at the grocery store. On October 1, 2015 the southern islands of the Bahamas were hit by Hurricane Joaquin, a cat 4 storm with maximum wind gusts of 155 mph followed by flooding. Southern Long, Rum, Crooked, Acklins and San Salvador took a direct hit and were devastated. The cargo ship El Faro, sunk 35 nm off of Crooked. Many cruisers departed Florida with extra supplies to donate and there are daily volunteer work crews to help clean up. Long Island is also the home of Dean's Blue Hole. According to Wikipedia, Dean's Blue Hole is the world's deepest known salt water blue hole with an entrance below the sea level and is 666 ft deep (The maximum depth of most other known blue holes is 360 ft). Although scientists still debate how blue holes form, most geologists think that it formed due to underwater erosion; a combination of dissolving limestone and a chemical reaction that happens when fresh water and salt water meet. What is a blue hole? a term for water-filled cavern or sinkhole with the entrance below the water level. They are also known for their abundance of fish. It has been the site of the free diving championships and a YouTube video. Salt Pond Day 2: It's a little rolly as the wind switches through south (our anchorage is exposed to the south. At midnight I come out and sit in the salon, then lay down. It's more comfortable so I retrieve my pillow and curl up. The cat notices my presence with a meow and later Husband comes to check on me. At some point we swung through west and I sleep past sunrise. It's lazy day on the boat. No WAY we're going to the dinghy dock in this. After lunch the winds slowly clock north and we're tucked in nicely. I start to consider checking out the store when I get a text. 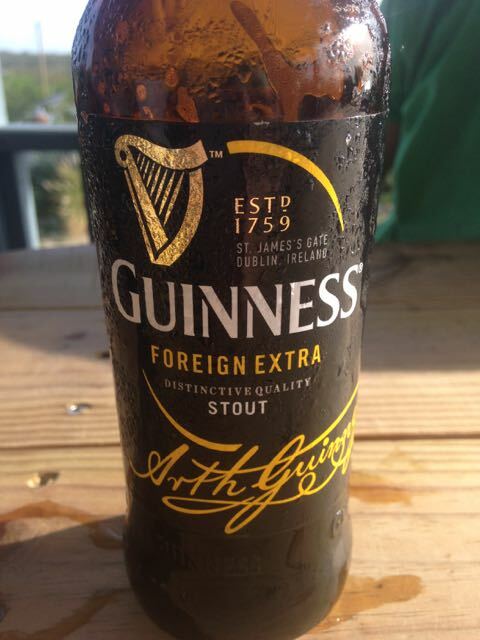 "Happy hour. Same place. Magnolia leaving." Dang it! We decide on visiting the grocery store and eating early before everyone arrives so off we go. We're the first dinghy at the dock, so we make the executive decision to use the other side and even though the tide is higher, is rollier because we're farther across the bay from the north wind. I'm having second thoughts (derecho flash backs), but we continue on to the store. Just as I had been advised, the selection is excellent and the prices are reasonable--$4.97 for a small jar of peanut butter (we consider less than double a good deal). We are at Sou side Bar & Grill by 4:00 pm (food takes a long time here) ordering the special of chicken curry & ribs (it still took more than 30 min). Kelly Nicole appears and we're off and running. Magnolia arrives and joins us. They are Kelly Nicole's sister ship and happy hour is in their honor since they are headed back north. When we depart, the water has calmed down, but it's dark. Several new boats have arrived while we've been in town and we weave our way back to the boat. A monohull has anchored close to us and stays up in the cockpit well past 9. We can hear their conversation in our berth. Salt Pond Day 3: The water is flat calm with a slight breeze through the hatch. After a restless night last night, I sleep GREAT! 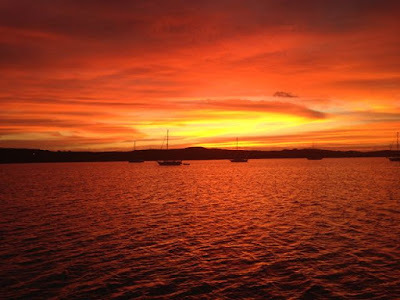 I attempt to rollover at 6:30 am, but the brilliant oranges of the sunrise pull me out on deck. By 9:00 am, The Captain has fuel cans in the dinghy and we're headed for the government dock to meet the fuel truck. He gives The Captain a ride to the gas station down the street while I walk the other direction towards the Farmer's Market and the grocery store. He brings the dinghy back to the dinghy dock and is headed the other way towards the Marine store when I come out, so I plop down on the dock and watch the fish until Dos Libras arrives. After another quick discussion about routing, they depart for the market. We're back by lunch & tinker around the boat the rest of the afternoon. Texts start flying about weather, departure times and more routing. Charts and guidebooks are drug out again--there are infinite possibilities! I receive an email with a contact name and the good news that "basic services are restored on Rum." Yeah! Pasta Marinara with the wonderful Italian Sausage from the meat market in Georgetown. Calabash, Long Island: I'm up with the chickens before 6:00 am after a great night sleep (is there a bay in the Bahamas without chickens?!). Calm waters and a nice breeze through the hatch. With a big weather window, we're headed for Cala"bash" on the north end of the island. It has a reputation as a rolly anchorage and is only protected from the east but it's a leisurely 24 mile sail (then 32 mile motor to Rum). We depart at 9:00 am with Kelly Nicole in the lead. 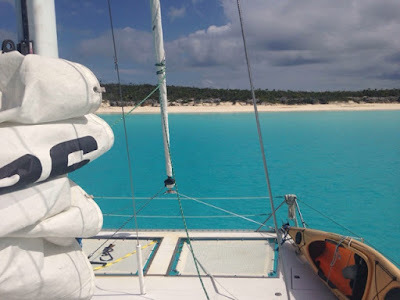 We are ghosting along at a leisurely 3.5 kts in the clear turquoise water with a blue sky overhead (the occasional threat of rain that never materializes). Our second leg of pure sailing. The quiet bliss of no engine noise. Texts fly as we're passed by a monohull--"are they motoring? I hope they're motoring!" 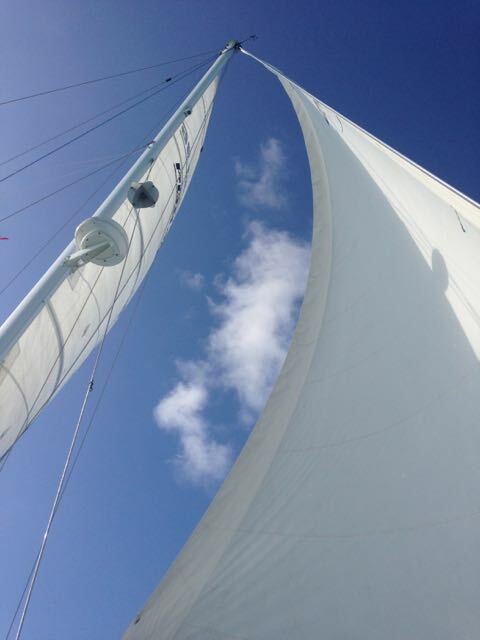 The Captain attempts to deploy the spinnaker but our new sheets are a little short--and there a dark cloud ahead. 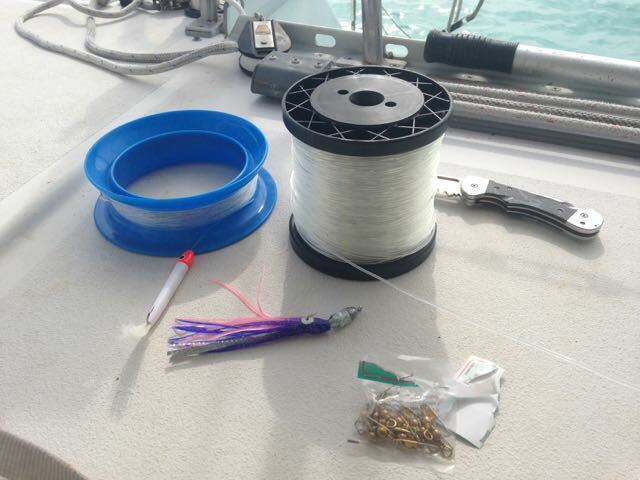 The Captain bought more line & lures so two trolling lines are deployed. Kelly Nicole enters the bay through the south entrance (Active Captain advises stray coral heads) so we continue farther north to a hole in the reef then turn in on a 90 degree heading to the "white house with the peaked roof" (just kidding, we used the Garmin--good thing, because they've built more houses on the shore! I did neglect to confirm the flag pole & windmill so I was looking at the wrong house--my bad). It feels like we are getting more off the beaten path, but we end up anchoring off the beach of the Cape Santa Maria Resort. Open wifi! Woo hoo! In the interest of exploring, we go in to check out their bar. Free conch fritters, pizza and nachos. I had my first Gin with coconut water and sweet milk. I like it! Stats: Total time 5:17, avg speed 4.7, total mileage 24.7 nm, sailed 3/4, motored first 1/8 and last 1/8. 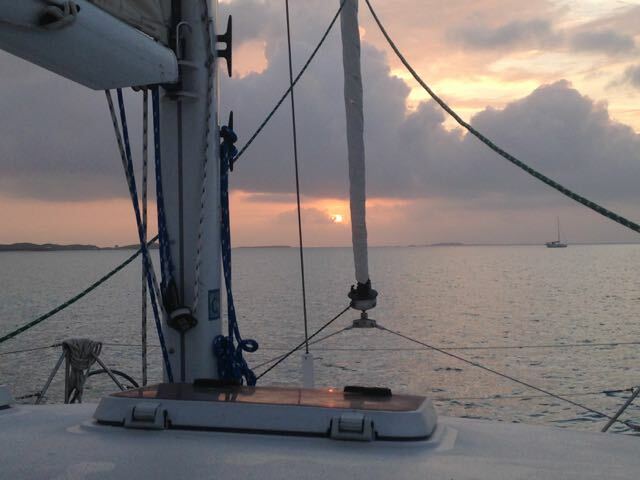 Rum Cay/Conception Island: We got a good nights sleep with only a minor rocking motion but I'm up by 5:00 am. 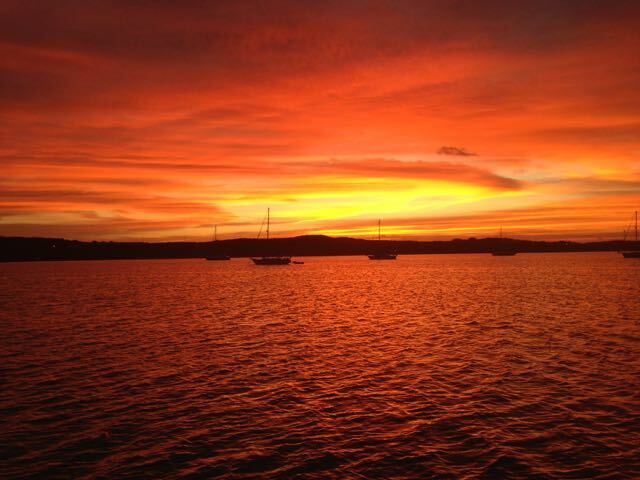 It's another early morning with the main sail and anchor up by 7:30 am. We depart through the reef off the white house with a peaked roof on a heading of 90 degrees. We thought we may motor to Rum Cay, but the winds (and the First Mate) favor Conception (we can also spend the night safely--because it is only protected from the east). Who are we to question Bruce Van Sant? #thornless. Sails ahead of us peel off for Cat Island. Motor sailing, close-hauled will put us just west of Conception, so we continue northeast bound. The waves are only 1-2 ft but are confused, coming from the NE and E with only the occasional splash over the bow. It's not a great ride, but at least it's a short day. The Captain plays with different ways to run the sheets for our genoa trying to get us closer to the wind. We see Kelly Nicole's AIS attempt a turn east then turn back north and a tacking race with Tattoo behind us begins. We finally turn east and motor the last hour into the bay, with deep water, right up to the entrance reef. Captain is on a dry streak. Two trolling lines and no fish! Anchored 250 ft off the beach in Conception. This is the "gin clear waters" we've been hearing about! The trimaran from downtown Georgetown is here along with 2 other boats. We work our way around coral heads and snug up to the beach. We end up only 250 ft off in a shallow spot, but a couple monohulls work their way in closer. We gave up too quickly! Swimming to the beach is favored over the dinghy here. We have cheese and crackers for a late lunch then I jump in for a swim over to the beach and a walk as Kelly Nicole arrives. White Bird rolls in. I return as Tattoo arrives and sails onto their anchor because of engine problems. We throw the snorkel gear in the dinghy and head to a beach off point and snorkel out to the tallest reef I've seen but it's not in good health. However, there are lots of fish including some small barracuda, a large Parrotfish and a tiny turtle. (We're too chicken to round the corner for Van Sant's "kiddie pool"). By sunset it is 11 boats. Stats: Total time 4:42, avg speed 5.2 kts, total mileage 24.5 nm (Distance over water 22.0). 3/4 motor sailed close hauled. 1/4 motor. I enjoy your blog. It brings back loads of memories of our journey in Algoma (PDQ36) in 2001. Very fond memories of Trinidad, and all the different islands along the way. 2001...seems like yesterday. Thank you, Mary. I'm happy to share our journey!